After a short stroll around Kawaramachi, I hopped on a bus and headed to Gojo-zaka to see the Hanatouro. The Hanatouro (which I only found out about in January this year) is a small festival where they line some of the Kyoto streets with lanterns. I could have walked there (from Shijo-dori) but… it was too cold and I had the bus pass to use anyway. I hopped off the city bus at the appropriate stop and strolled up Gojo-zaka. It wasn’t lit up at the beginning of the road, which made me doubt my directions somewhat but it seemed to be correct. There were a few people walking up the same road ahead of me so I just trailed them until I saw little lanterns lining the street and then I was completely reassured. Lanterns line the steps up to Kiyomizudera. 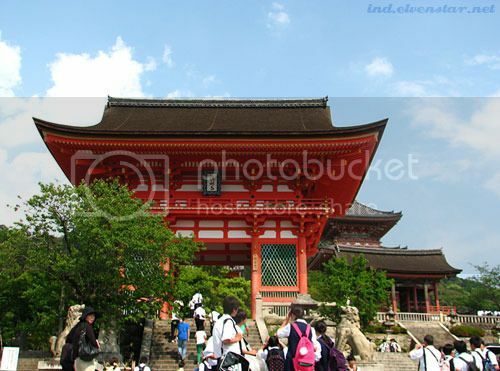 Kiyomizudera, it’s been 3 years! Walking down the street leading from Kiyomizudera to the main road. Matsubara-dori, I think it’s called? Turned off midway to go down Sannenzaka and Ninenzaka, where I saw lots more people. Occasionally the path would be clear of people just long enough for me to get pics like this. There were also some ikebana installations here and there. I like that the little lamps were different from place to place. These looked like the containers were cut out of bamboo (although I’m not sure if they actually were…). Fiddling with camera settings gave me this pic – where it almost looks like the lamps were floating in the darkness. Maruyama Park (which I visited last year with Mum!) was my last stop on the trail. This map *points below* shows the illuminated pathways in green and red, with red being the path I took (starting from the bottom of the map). Based on the timestamp in my photos’ EXIF data, it took me about an hour to walk that route slowly, stopping to take pics along the way. I walked back to my hotel from Yasaka Shrine. Mostly because I realised I’d lost my bus pass… But as I’d used the pass more than three times that day (the pass is only worth the money if you use the bus at least three times in a day) I didn’t feel too bad about it. It was about 20 minutes from Yasaka Shrine to my hotel (near Sanjo-dori) on foot. Cold, but doable.